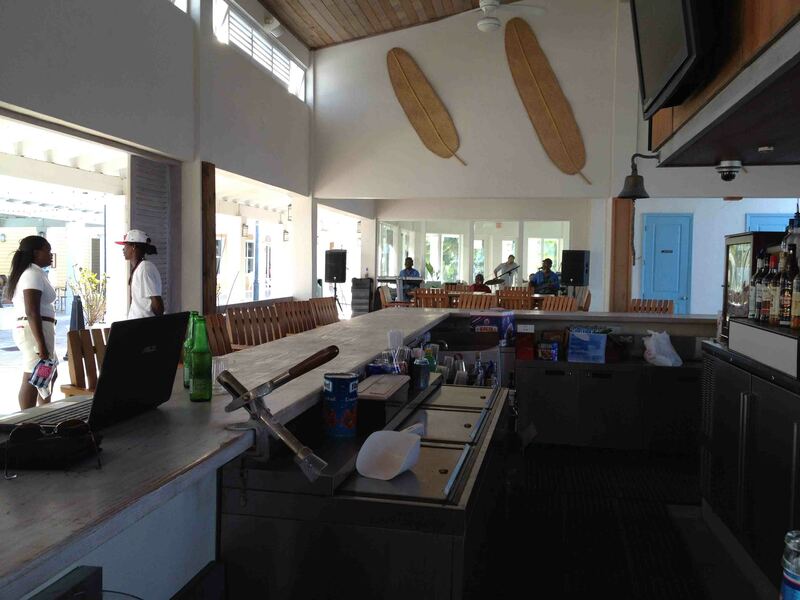 Poor internet in Bimini did not allow me to update the Blog. 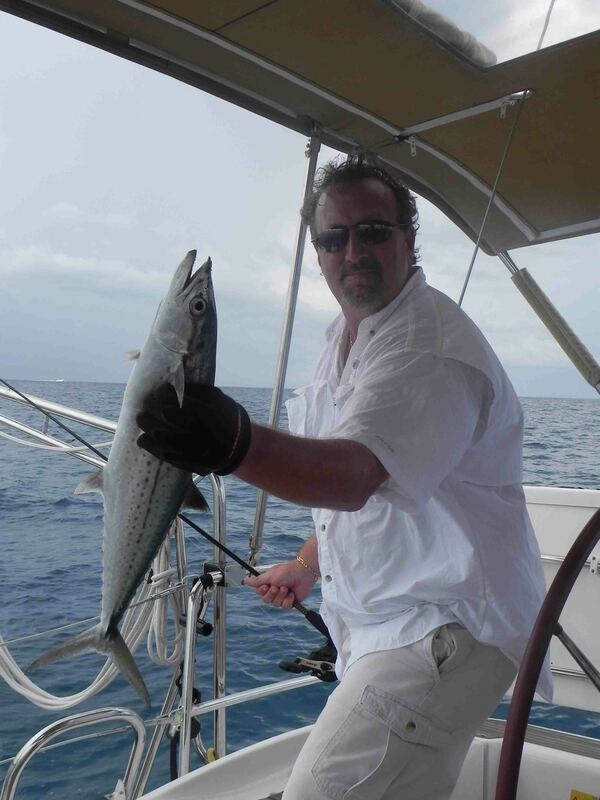 Back in the US tonight after a great time meeting new friends, fishing and sailing. Here are a few picutres from the past few days. 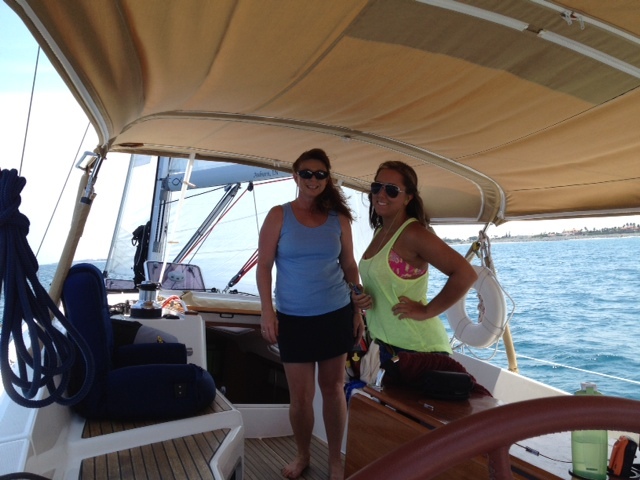 We spent most of the day July 4th in preparation for the trip to Bimini. Watched the fireworks from the boat where we had a great view. Left the dock from Miami marina at 4:15am. The near full moon was high in the sky lighting the ocean and did so till the sun came up later. After clearing the freighters, there was only the glow of the moon and the skyline of Miami in the background. 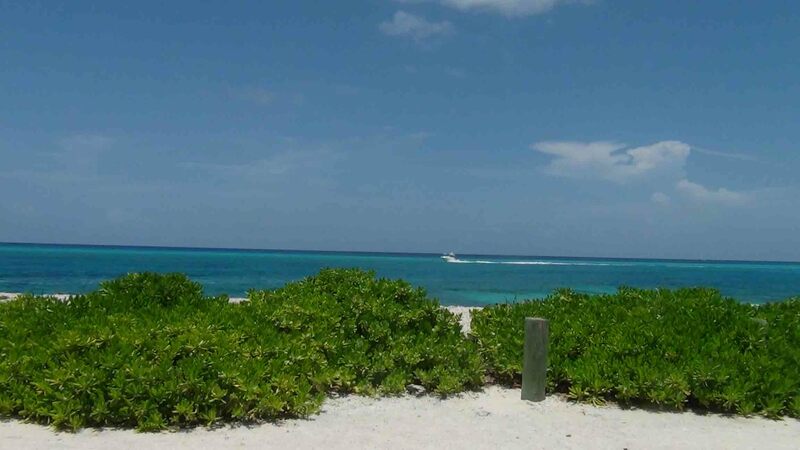 Bimini is a very small island 4 miles long and 750 feet wide. Crystal clear water and all types of sea creatures. The balance of the day yesterday was getting cleared through customs and finding our bearings around the island. Not many cars, mostly golf carts they call “Cars” here. The marina is sold out of Cars so we are forced to use the one and only island taxi. The drivers name is “Milton” and he is a pretty dependable cab driver except when it comes to the price which can change at any time. 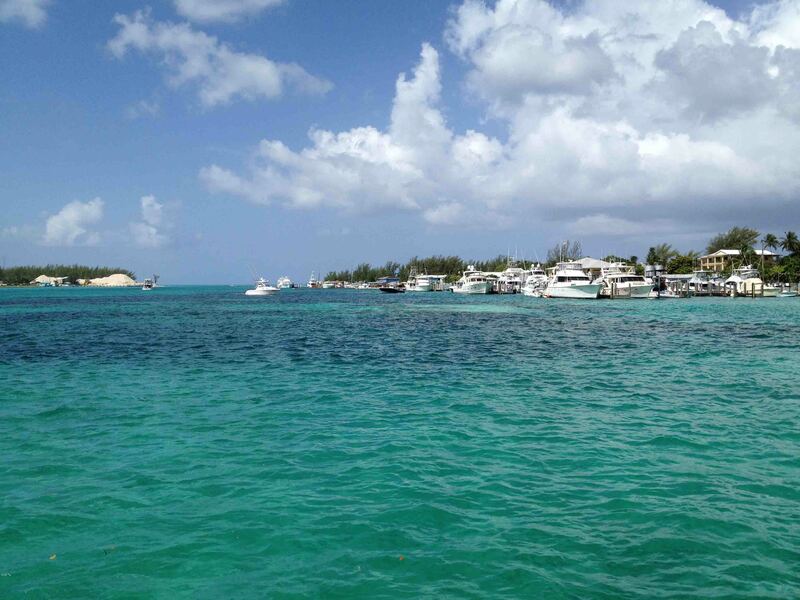 The island is basically the original Bimini Island to the south and new housing and marinas to the north. All types of boaters from Florida are here. We met a group of people from the Coral Reef Yacht Club after dinner last night. We are invited to their Dingy Poker Run at 11am this morning. They have 60 people signed up including lunch cooked on the beach on one of the islands. Pictures to follow on my next post. Some type of tropical wave is in the eastern islands and I need to investigate closer and adjust our schedule accordingly. A second note, Lighthouse point marina did find us a dock so that matter is settled. Sorry to those who follow my blog for the lack of a post yesterday. The day was spent dealing with dockage issues and work. We snorkeled Monday afternoon at a small beach just below the Hillsboro inlet lighthouse. The venture was to test gear more than an actual great place to snorkel. There was a rocky reef beside the breakwater that did contain all types of tropical fish. It was an unexpected pleasure when just as we left the reef, there were people yelling from shore and pointing to the reef. There were two Monterey’s going through the area we had just snorkeled. The rays were having a feast on the fish we had just been watching. The first and largest had a 7’ft wingspan and the smaller had a 3 foot wing span. I wondered if it was a mother and baby. They were just 25 yards away from us as they ate along the reef. What a graceful animal. We decided to take the intercostal to Fort Lauderdale for dinner. We docked at the same marina we had been at for New Year’s. 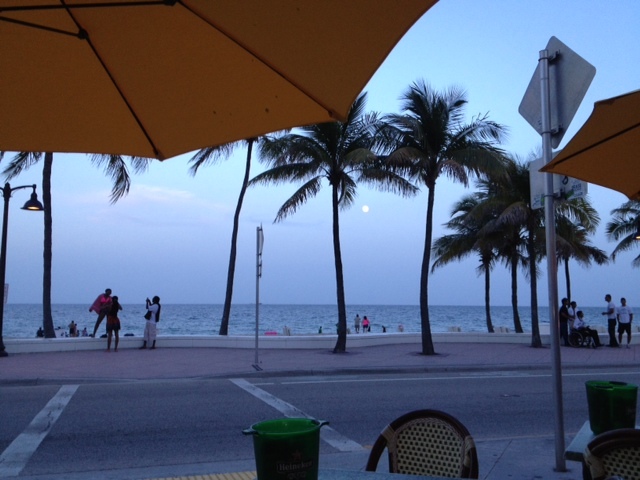 The near full moon was just rising over the beach making it a great view as we had dinner. The drive back up the intercostal was quiet and we were able to see inside several of the large homes with their impressive interiors. Tuesday morning was spend dealing with the marina since our dock was found to be too small. We thought we had this settled and it is a big deal that we have no marina to leave the boat. 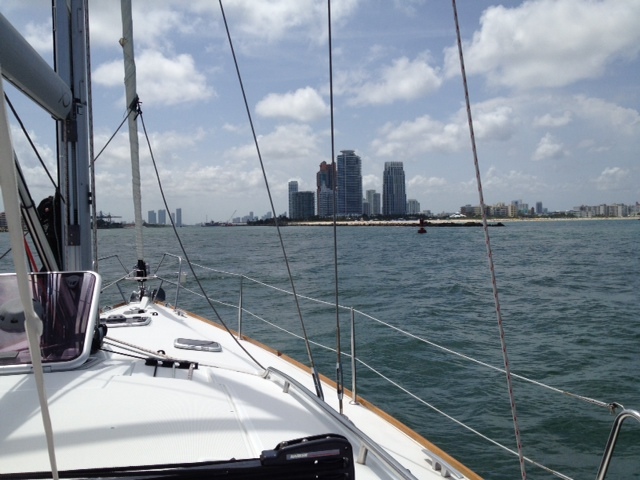 Some upsetting issues at work completed the afternoon as we traveled in the ocean between Hillsboro and Miami inlet. We arrived at the marina around 5pm. We have been to this marina before so we knew our way around. We decided to spend two nights at the marina in order to watch the fireworks tonight and allow time to prepare for the trip. We walked the south beach strip last night and ate at a great Italian restaurant. We visited several of the places we had found on prior trips and were hold about a rooftop area at the top of one of the hotels. This may be a great area to watch the fireworks since both the city of Miami and Miami Beach have a fireworks show at the same time. We plan to leave for Bimini, Bahamas for a few days very early in the morning. 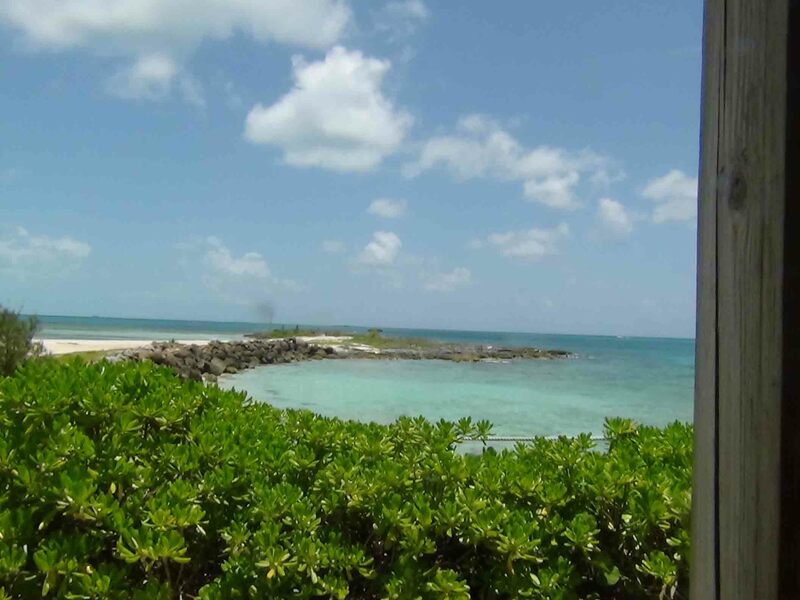 The trip to the Bahamas may not allow blog posts as internet may not exist. There is a weather front building that may give us 3 to 5 foot waves coming from the east but there is currently no tropical activity to worry about. 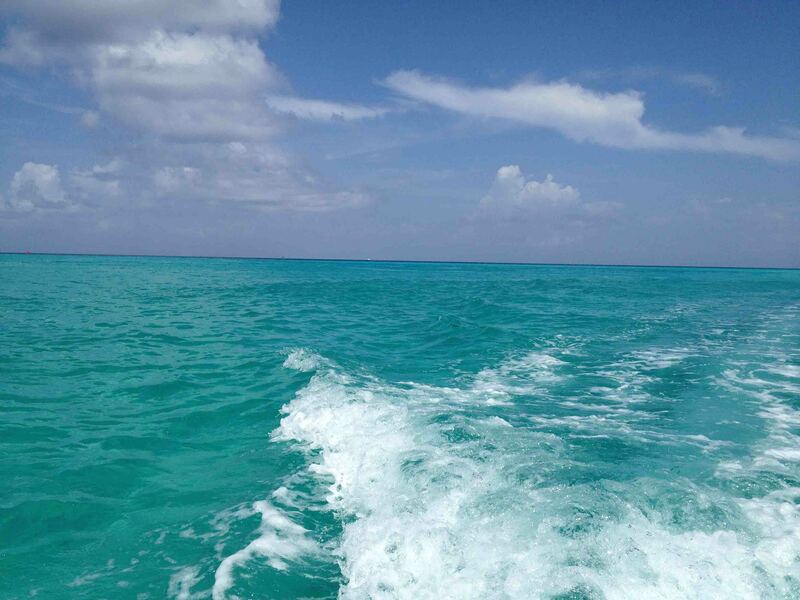 I would like to stay in Bimini two to three nights if the weather holds. The girls insisted in sleeping in today and then we will be preparing for the Bahamas crossing, changing fuel filters, locking up guns properly, getting the proper Bahamas flags ready, some final provisioning and a good night’s sleep. 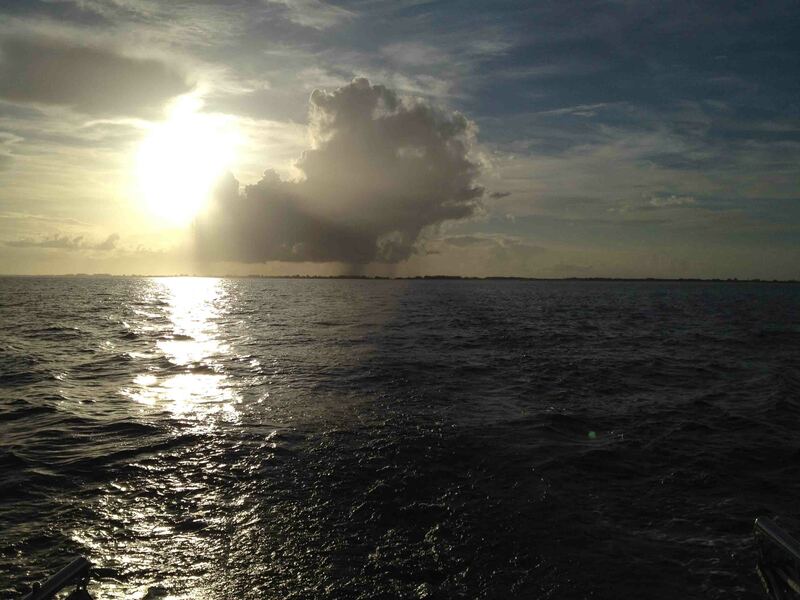 If the seas get too rough in the morning we will simply turn around and spend some time in the keys. Yesterday was a long 12 hour trip to Lighthouse Point Marina. The edge of the golf stream was providing over a knot and higher of north moving current that slowed our progress. I think we averaged less than 6 knots per hour the entire day. We arrived at the Hillsboro Inlet Drawbridge around 6:30. The day at sea had been sunny, started out in the morning with calm winds that grew as the day passed till we needed to put the plastic up to stop the sea spray. There was lots of boat traffic up and down the coast. Lighthouse Point Marina was just as we had remembered it from three years ago when we stayed here many times with the 26ft Searay powerboat. 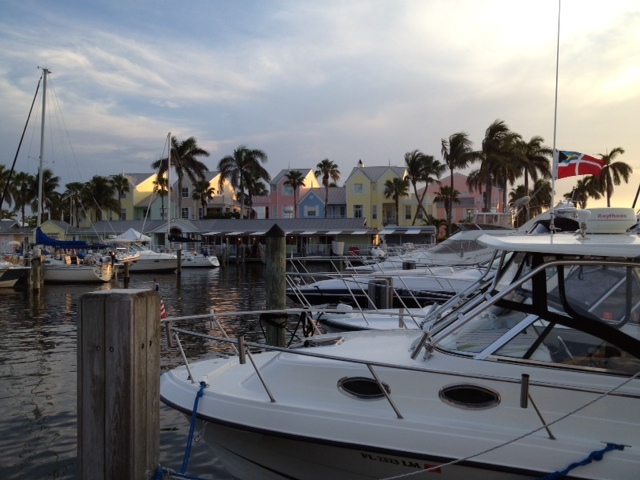 The marina lays just inside the Hillsboro inlet tucked just off the intercostal waterway in a cove. The area is full of boat channels and multi-million dollar houses everywhere. 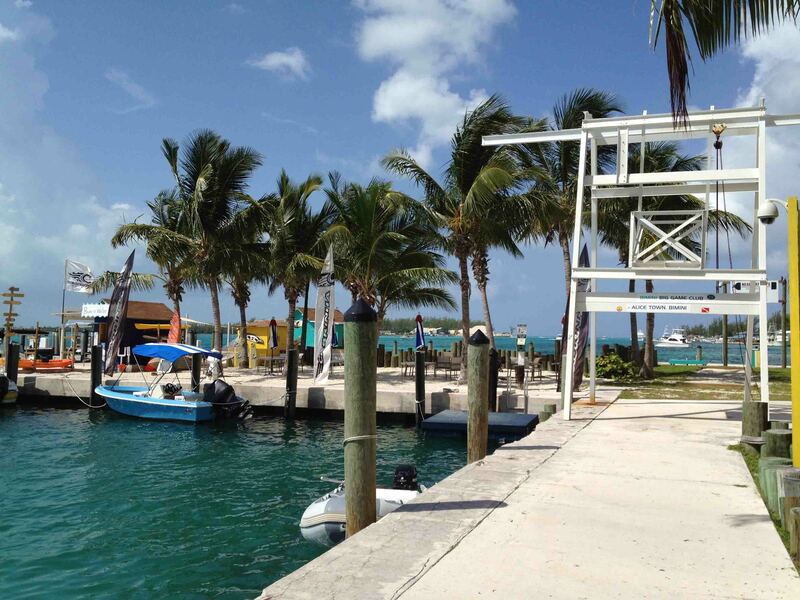 The small family owned marina has only 100 slips, a restaurant and is located in a very secluded area. There are a million things to do located very close by water or land. Fort Lauderdale is 9 miles south and West Palm Beach just to the north. Today we are doing boat chores, getting settled into our new dock and will dig out our snorkel gear for a trial run this afternoon. It is hotter now that we are back land bound but the girls are looking forward to nice long showers at the marina shower facility. We will begin traveling again tomorrow after a day of rest today. 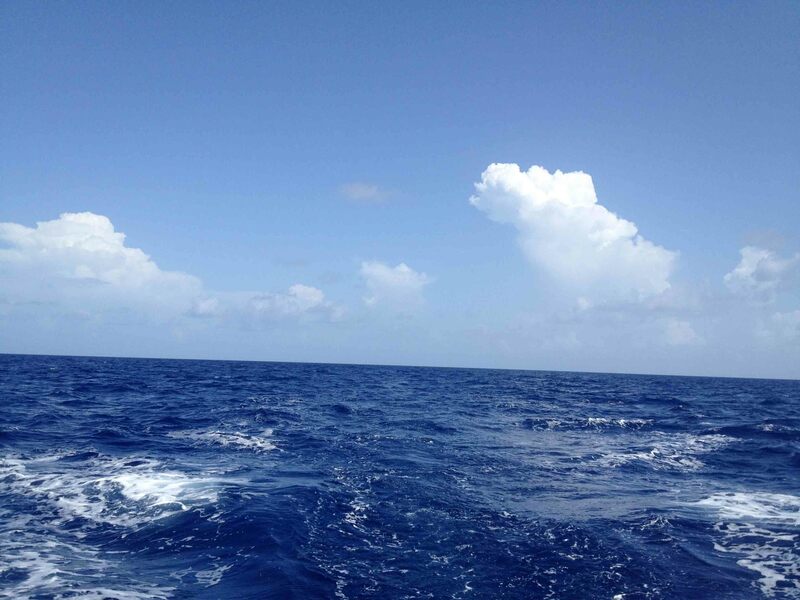 We had a long day at sea yesterday (17 hours and 110 nautical miles) as we decided not to stop at Canaveral and go another 50 miles south to Fort Pierce. The shoal at the cape puts the track well off shore as you head south. 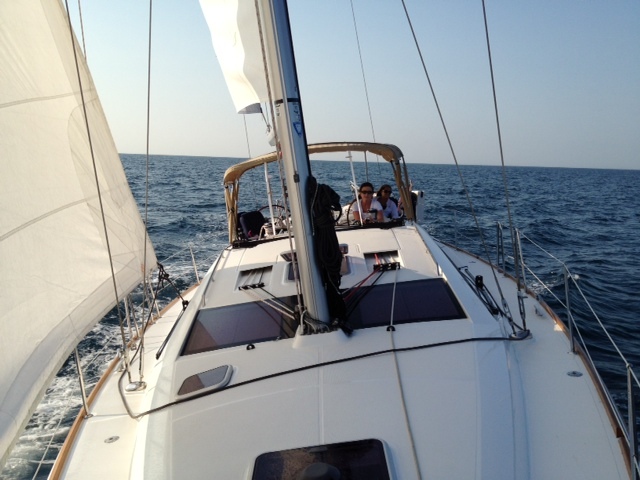 The wind was 10 knots just off the port nose allowing for a close hauled motor sail down the coast. 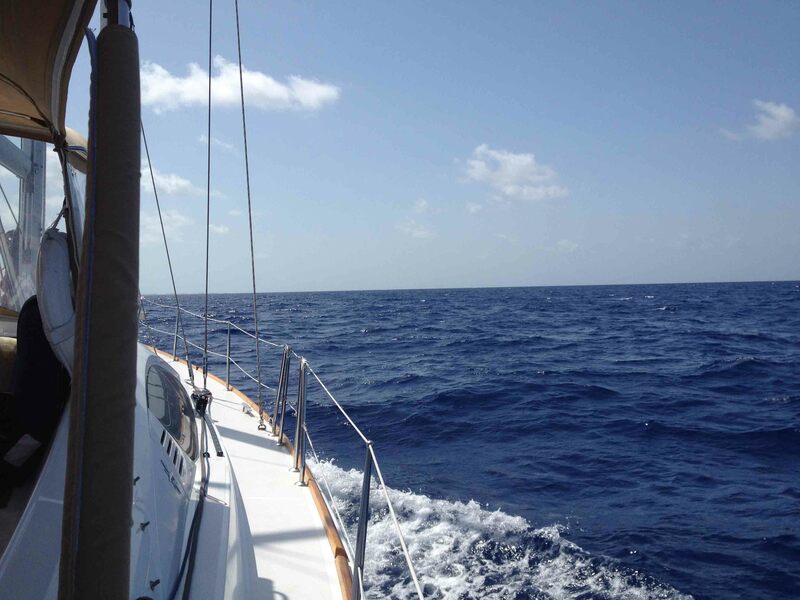 With sails out, we gained .5 knots (from 7.5 to 8). The sun set around 8:30 but the almost full moon lit our way as we sailed the next two hours towards the inlet, awsome experience! As we entered the inlet it was 11:00pm, the current was going out at a speed of 4 knots. This made the entrance to the jetty very rough and what is normally almost 8 knots of boat speed only 4. Just as we passed the breakwater in the narrow channel, someone called me on the radio and said a freighter was on the way out of the inlet and I needed to vacate the channel. “To Where”!!! I ask,! no response from the caller. I then heard the freighter captain on the radio stating he would be delayed for about 15 minutes which gave me plenty of time to get up the channel to the intercostal. Never the less, the adventure led to a few tense minutes while I searched for a place to get off the chanel in the dark in a raging current that would run me aground hard with the slightest mistake. As we cleared the channel, the marina was a short run up the intercoastal. We tied the boat at the gas dock and after a cocktail on the deck, retired for the night just after midnight. Woke about 1:30am to the sound of alarms going off in the cockpit. Found to be a low voltage alarm caused by the main circuit breaker in the power locker had been bumped shutting off the circuit breaker. The inverter and batteries had only lasted a few hours since we had the water heater and battery charger turned on. A quick “get dressed and go above” found the problem and I returned to a badly needed nights sleep. My alarm when off at 5:50 and I nearly fell back asleep before getting up at 6. The marina opened at 7am. We needed fuel and to pay for the nights stay. Washed the salt off the boat as i waited for the marina to open. Departed at 7:30 heading out the inlet and south for Hillboro Inlet or Lauderdale. Hillsboro arrival would be around 6pm and Lauderdale around 8pm if things go well. Sunny morning with a light wind. 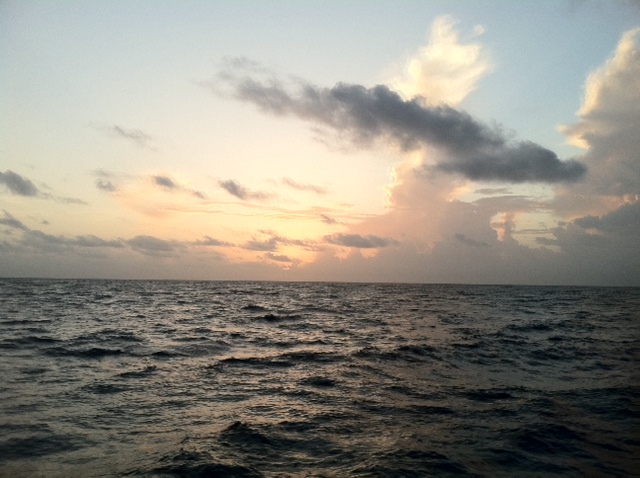 Unlike yesterday where we were 10 miles off shore most of the trip. The land fades away to the west as we go south. The shortest route today is to stay close to shore. This means a closer eye must be kept for things we could run into. We are doing 2 hour watches with three people which makes it nice to do my blog and projects around the boat today. 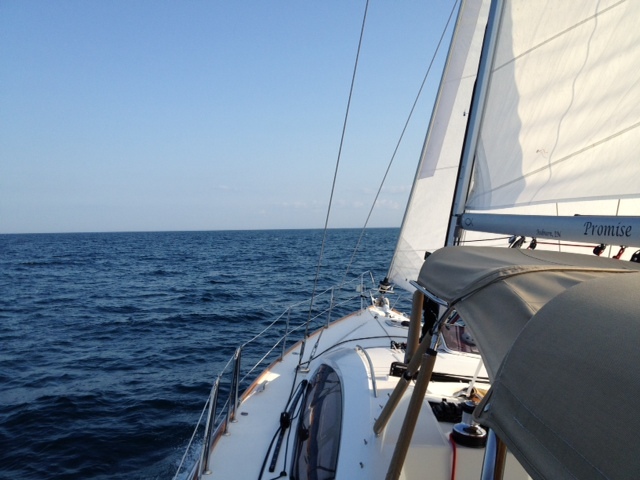 Left the Halifax marina this morning and now out to sea heading south. 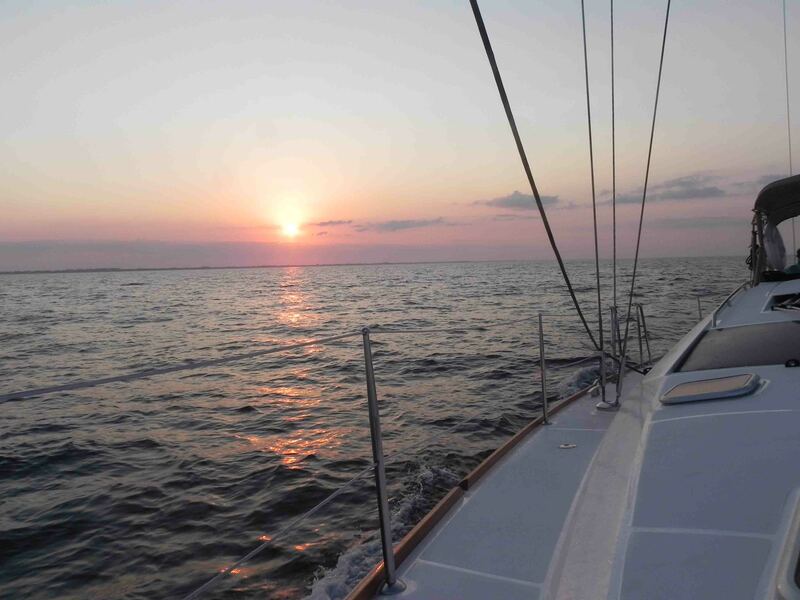 We have great weather with no clouds in the sky, calm seas and light wind. 60 miles to Port Canaveral where we plan to spend the first night of the trip. We are excited to be joined by our 18 yr old niece on this trip as that give us a third hand on long days and also help with daily boating tasks.